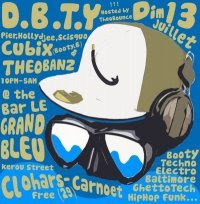 Our french section is playing at what seems a pretty huge party tomorrow, DBTY at Le Grand Bleu. Dbty-members playing are Sisquo, Holly Djee and Super F. We can't be there but we'll be preparing for the huge chain-handover party in to weeks at Pleasant instead. If you're living in Bretagne though, there's no other place you should be than with our Ne Blameons Pas La Jeunesse-homies. In Stockholm we feel like The Bumblebeez - we wan't to go to Rio.